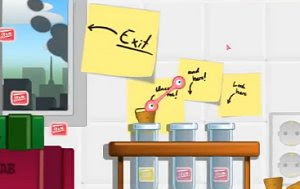 Fans of classic games Silly Putty and World of Goo will most likely enjoy Chewy, another sticky platformer where the player controls a piece of pink bubblegum. The original control system in this freeware game, where you use the mouse to show where your gum should go, will be used to navigate the few levels available. They are, however, cleverly design and full of obstacles and require some skill to make it to the end. Besides sticking to almost every surface, the gum is also capable of floating in air currents and pushing small objects. Chewy was developed by a team of students from the mADE school.